"So wait, do I own black people now?" "Yes, dear, but you own some white guys also." "Oh, thank God. I was worried for a minute." While this is certainly old news to anyone who watches basketball, this year the New Jersey Nets moved back to New York, becoming the Brooklyn Nets. I thought it was kind of rude to steal yet another thing Jersey was trying to do on its own, but then again I don't care in the slightest. Until I heard this: they moved because Jay-Z said to. Yes, he bought stake in the team and said, "Come to Brooklyn," so they did. That is the very definition of "baller," when you can buy your favorite ball team, tell them to play in your town, and build them an arena for them to do it in. Baller. 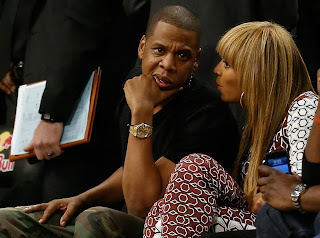 Now, some simple research shows me Jay-Z in fact only owns about 0.67% of the team, and is really more of a mouthpiece for the managing group's desire to move the team as part of a neighborhood rehabilitation and rejuvenation project, but that doesn't sound nearly as good as, "he bought his favorite team for fun."